If you’ve made the Roasted Flour Millionaire Shortbread and have some roasted flour left, why not try these Roasted Flour Giant Oatmeal Cookies. They are big, fat, cookies with a thick shell and soft chewy center. Bread flour seems to be key for the thickness and the roasted flour helps in that department too. The walnuts may also contribute to thickness, but I haven’t yet tested without walnuts and can’t say for sure. Thanks to Sue for double-testing these! Update: New photo burnt-walnut free photo. Teddy Graham to show scale. One more photo. I baked this batch at 375F in a regular oven for about 20-22 minutes. Dough had been chilled overnight and internal temperature of cookies was over 180. If oatmeal is not your thing, here’s a link to the Roasted Flour Chocolate Chip Cookies. 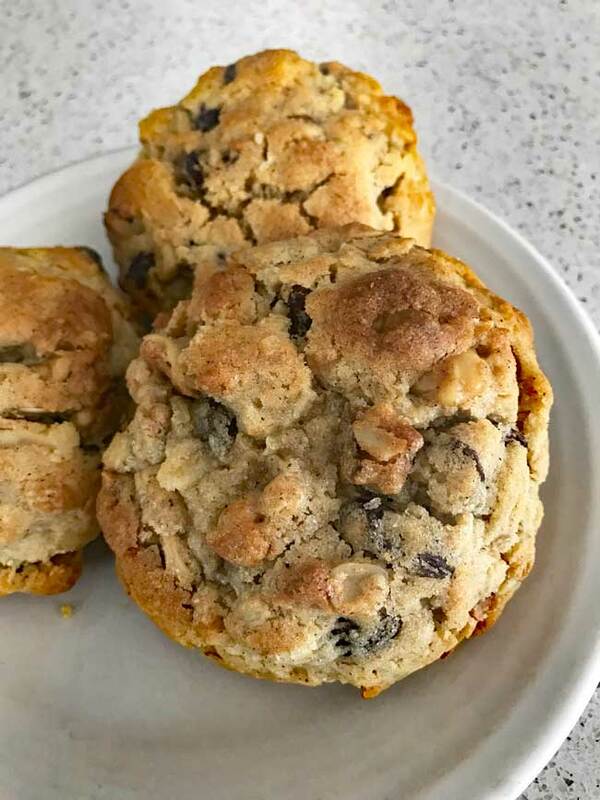 Roasted Flour Oatmeal Raisin Cookies (so that the Roasted Oatmeal Chocolate Chip Cookies don't get lonely). For best results use weights where indicated. Dough needs to be chilled for a few hours before baking. If storing overnight, chill for a few hours and transfer to freezer. In the bowl of a stand mixer with the paddle attached, combine the butter and both sugars. Beat on medium to soften butter, then continue to beat, increasing speed gradually, for about 4 to 6 minutes or until mixture is creamy and light. Scrape sides of bowl often. Add the egg and stir on low until mixed, then increase mixer speed and beat on high for one minute. Beat in the vanilla. In a separate bowl, weigh both the flours and add the salt, baking soda, baking powder and cinnamon. Stir very, very, well. Add the flour mixture to the butter mixture and stir by hand or using short pulses of the mixer until combined. Stir in the oats, raisins and nuts. Empty mixture out onto a clean surface or pastry mat and shape into 4 large balls. Chill the balls of dough for several hours. To bake, bake in a convection oven at 400 for 10 minutes, then lower heat and bake at 330 for another 10 to 12 minutes. To bake in a standard oven, bake on a parchment lined baking sheet at 375 for about 18 to 22 minutes or until done. Cookies should appear set and have some cracks in the top. Allow the cookies to cool for at least an hour before serving. To store, wrap individually and freeze. If your cookies are browning more than you like you can try reducing the heat (though you may get more spread) or just shielding loosely with a sheet of foil for last 7 minutes or so. This is an excellent cookie recipe. 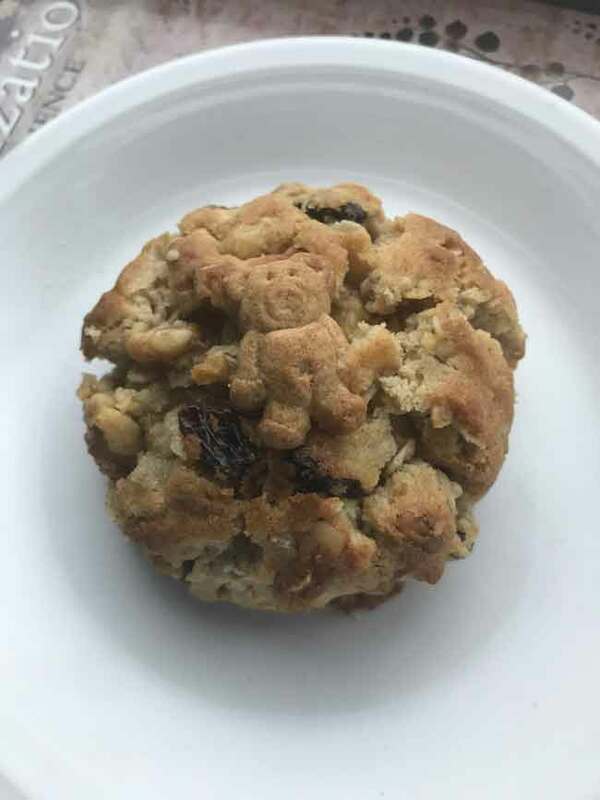 The cookies are special and unique. The oatmeal version did brown faster in my oven than the chocolate chip version. A little foil for the last few minutes kept them from over browning. The cookies spread more at 350, but feel free to experiment in your own oven. For me, the fattest cookies resulted from starting at a high heat and decreasing. Also, not all the cookies get that roasted. I’ll post a prettier one later. 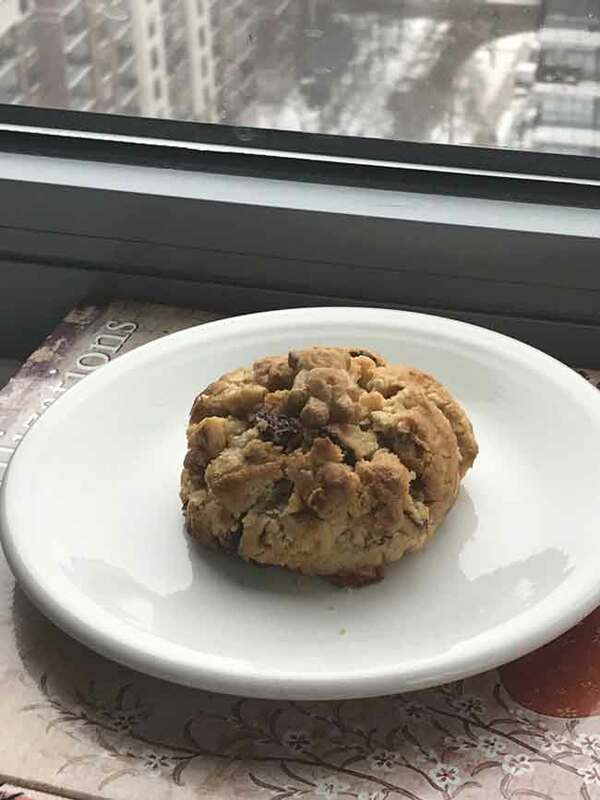 I’d love to hear how your cookies turn out, so please take pictures and send notes! Thanks. I wondering if the conventional oven was at 350 there would be less browning. The walnuts seem to get too brown. I can’t think of any similar cookies recipes that I bake at 375. That hot an oven is usually left to item that depend on heat to rise such angel food or initial hot oven to begin the process then reduced to 350 when adding the product. But even that I see more of a technique with muffins not cookies.